Where to Party Old San Juan is part of the Despacito! TPOL Moves to Puerto Rico Trip Report. If you’re visiting Old San Juan, get ready to drink. As an Airbnb resident of America’s Most Beautiful City, I stumbled upon a few places worthy of your time and others that certainly are not. Some will say that La Factoria is the best bar on San Sebastian. I am not a fan of the place. For my fellow Michigan grads, it reminds me of Rick’s American Cafe, only with expensive drinks. Those who have been to Rick’s will recognize these disgusting toilets, which is why this bar receives the distinction of grossest. If you can hold it for the night and are borderline blackout, the speakeasy atmosphere can be fun. If you’re sober, then picture going to Rick’s and drinking club soda all night. No bueno. Greengos was a decent choice for watching the World Cup in Old San Juan. Tijuanas was nothing special (see The World Cup! Where to Watch Sports in San Juan). Missing your local dive? 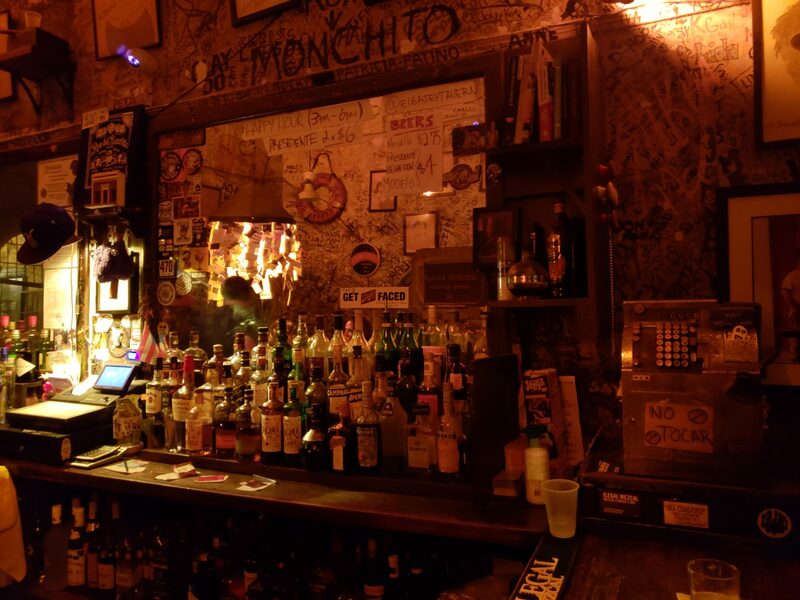 Go to El Batey, the oldest bar in Old San Juan. San Sebastian is full of bars with different music for all tastes. Most were surprsingly empty even on the weekends. This tavern had plenty of beers on tap, but it was lacking in energy. Like La Factoria, drinks are not cheap. There are plenty of great murals along the streets, further boosting my assertion that Old San Juan is America’s most beautiful city. If you’re not looking to unwind on a Sunday, head to La Verguenza. There is live music, dancing, and the best mojito known to man. The sunset view of the sea can’t be beat. Partying in Old San Juan was surprisingly disappointing. I still have to go San Sebastian Street Festival, but apart from that that, I have no interest in returning unless it’s for a mojito at La Verguenza. Next articleMuseum of New and Old Art (MONA) Tasmania: What the £µ¢&! If you ever watched Trainspotting, La Factoria will remind you of The Worst Bathroom In Scotland. Yuck.